It's the second week of school and I am already sick. I woke up this morning with a nasty cold, which only got worse as the day went on. My oldest had to miss school today as well. I love how I'm not sick all summer and then as soon as my oldest goes back to school, bam. I also am not a fan of the fact that I always getter sicker than anyone else in the house. My kids are sick for a couple of days, I get pneumonia, strep throat, you name it. Plus it's never a little bit of pneumonia, it's a hospital stay, or weeks of strep throat that doesn't want to go away. I seem not to be able to do anything part way, it's all or nothing. When I'm not feeling my best, I rely on my slow cooker. Slow cooker meals take little prep and are great when I don't have the time or energy to make a big involving meal. Tonight I tried a new recipe for Asian Five Spice Meatballs from Family Circle magazine. This recipe has 13 ingredients. It takes 6 hours and 20 minutes of total time, 20 minutes of which is active and makes 6 servings. I did make a number of changes to the original recipe. First since I eat gluten free I used gluten free bread crumbs. I did not have low sodium soy sauce on hand, so I just used the regular that I already had. Veal is very hard to find near me, so I substituted ground Angus beef. I used 1/2 pound 93 percent lean beef, 1/2 pound ground Angus and a 1/2 ground pork. In total I ended up with 13 meatballs. Changing recipes to gluten free can always be hit or miss. This recipe turned out perfectly. The meatballs stayed moist and the flavor was delicious. Since there wasn't enough sauce after the meatballs were done I made my own. I used 3/4 part grape jelly and 1/4 part sriracha. It had a nice spicy sweet flavor and was perfect to drizzle on top of the meatballs. Plus it pays tribute to West Virginia, since grape and hot pepper jelly with meatballs is an appetizer staple. 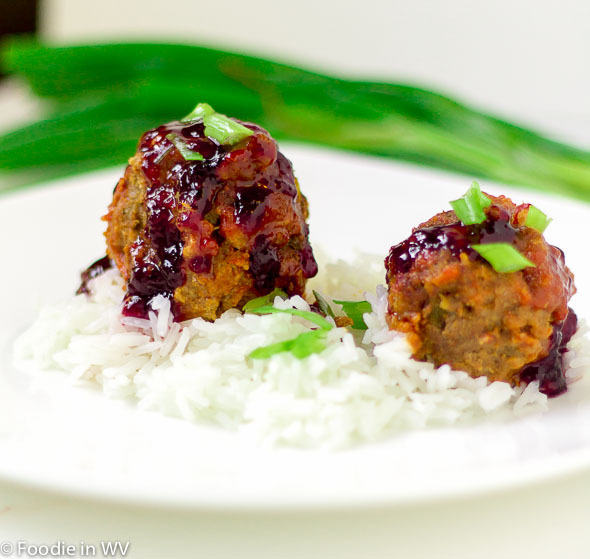 A flavorful slow cooker recipe for Asian Style Meatballs made with 5 spice powder. Only 20 minutes of active time. Hope you feel better. I always feel like I get sick the first few weeks back to school too. It s the exposure to all those new germs I suppose. Maravillosas albóndigas una estupenda receta me encanta y la fuente de agua también,hugs,hugs. 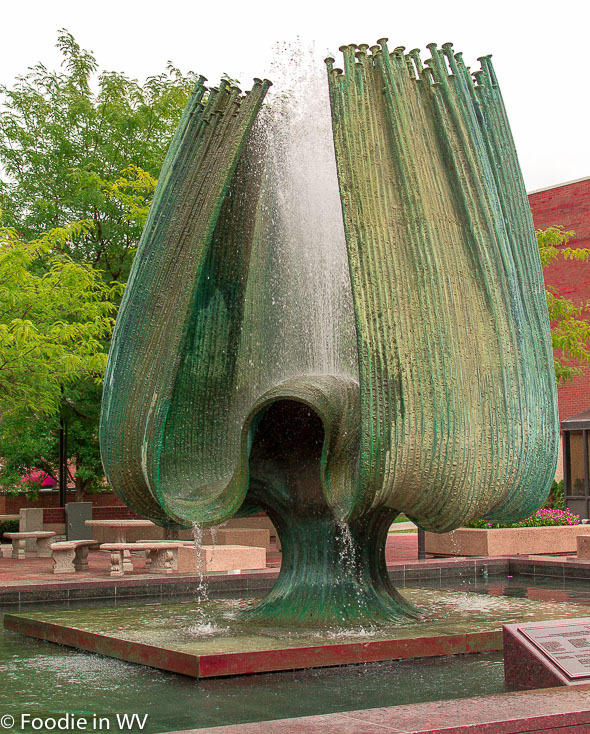 Thanks :) I love the fountain also, it was one of my favorite things when I went to school there! what an interesting sauce using the jelly. i can imagine the sweetness it would give to the meat. sorry to hear you guys have been sick. same here...first week of school and mu daughter is sick. today i started to feel a little under the weather. The sauce works well since it has a spicy sweet taste, it was a nice addition to the recipe. It seems that a lot of us are getting sick the first week :) I hope that you and your daughter feel better! Those meatballs are totally fancy and delicious! What a fantastic and delicious combination of flavours. The flavors really do work well together. The 5 spice powder made the meatballs have a nice flavor without being overly spiced. Sorry to hear that you are not feeling well. A slow cooker meal is perfect when you need to be resting and it sounds like you chose a good one. Slow cooker meals really are great when feeling under the weather, I agree! So sorry to hear that you're not feeling well. I've had a migraine for 2 days now and it seems like its not going anywhere. :( I love those photos of the memorial fountain. That is so unique! I still don't own a slow cooker and I really need to invest in one. Is there one you recommend? I love meatballs and those look super delicious! I have migraines, they are the worst! I hope your migraine goes away, they can be so debilitating. You definitely need to get a slow cooker! The one that I have is by Hamilton Beach. I like it since the lid locks in place. That way you know that the temp is staying constant. I usually end up getting sick by the end of September, too. We still have 2 weeks before we go back, but back to school means germs. I am going to try this recipe this week. Meatballs are my favorite! School do seem to have a lot of nasty germs :) If you try the recipe tell me how it turns out! I've got a cold too-my first in I can't tell you how long! I can only imagine that since my kids are now homeschooled and we aren't really social I picked it up as we were grocery shopping last week or my husband brought something home from work. These meatballs look really good. I've tried 5 spice before but didn't really know what to do with it. Thank you for a great idea! The grocery store is where I got most of my colds etc before my oldest started school :) People aren't great about touching the cart with dirty hands. 5 spice is really great when used in the right recipe. It's flavorful without being overly spiced. Those fountains are amazing works of art! Sorry to hear you are all sick. Especially when school just started. Get better soon! 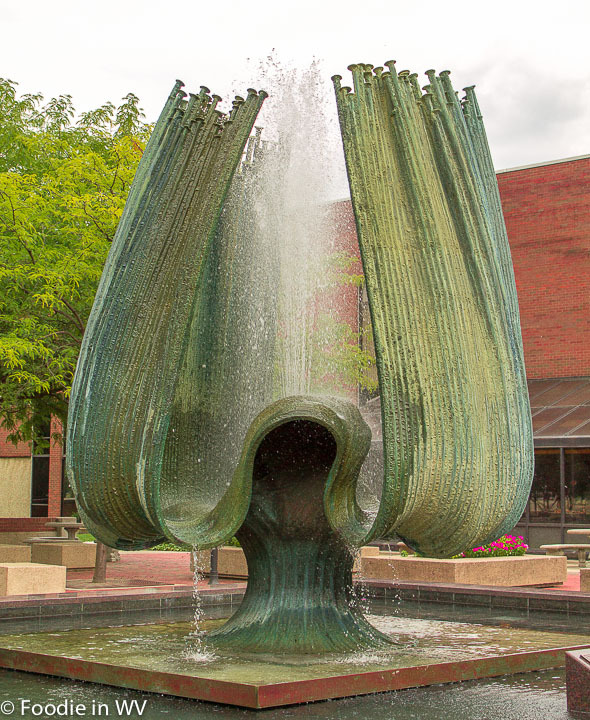 We are better today, thanks :) I love the fountains on campus, they are a memorial to the plane crash victims. I'm not a big fan of colds either :) I never have anyone to take care of me either, being a mom is never fun when sick! Love using the slow cooker rather than the stove any day in the summer time and I'm on another crazy Asian food kick again so these sound rather amazing! I have been on crazy Asian food kicks too :) There are some great flavors in Asian cooking! These look yummy. I'm always looking for more slow cooker recipes. Hope you're feeling better! I am feeling better, thanks :) I am always looking for new slow cooker recipes too, I love my slow cooker!